I have often thought that habitual, ordinary gestures, create the encyclopedia of forms that define our states of mind, expressions, attitudes, etc. And from the subtle differences in the way each actor performs them we have unlimited opportunities to see them again and again, in ways that add freshness, maybe even originality, to the interpretation. 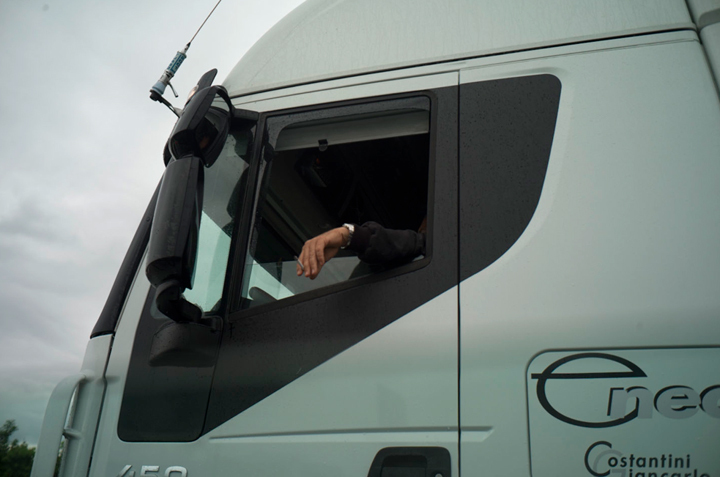 Here, at 60 miles an hour, the relaxed hand of the driver could have been in the same pose were he sitting at home on his couch watching the football game. However, as I passed him (my wife was driving) I noticed that in the overall grayness of the day, and the monochrome of the cab and its paint job, the fleshiness of his hand became the live element of the frame within the frame within the frame. Small touches, almost nothings, can often be the telling moment that makes me alert to seeing, even while being in a moving car at 60 milers an hour. This entry was posted in On the Road, Photographs from the car and tagged From The Car, Tuscany on May 10, 2015 by joelmeyerowitz2014.